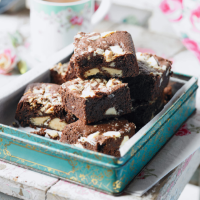 The secret of good brownies is to be generous with the chocolate and avoid over-baking because it dries them out. A great tip for really neat squares is waiting to cut them until the following day. 1. Preheat the oven to 180oC, gas mark 4. Grease a small roasting tin measuring about 26x22cm or similar. Cut a large rectangle of greaseproof paper and press it into the tin, snipping the paper at the corners so it fits quite neatly. Grease the paper. 2. Put the plain chocolate in a heatproof bowl. Cut the butter into large pieces and place on top. Melt, either in the microwave for short spurts on medium, or by resting the bowl over a saucepan of gently simmering water, making sure the base of the bowl doesn’t touch the water. Stir regularly until smooth then remove from the heat and leave to cool for a few minutes. 3 minutes until pale and foamy. Stir in the melted chocolate and butter mixture. Sift the flour and cocoa powder into the bowl and gently stir in using a large metal spoon. Stir in the white chocolate and turn into the tin. 4. Bake for about 30 minutes or until a sugary, cracked crust has formed. It should wobble very slightly when the tin is shaken. Leave to cool completely in the tin. Serve cut into small squares. This recipe was first published in Thu Aug 27 11:49:00 BST 2015.